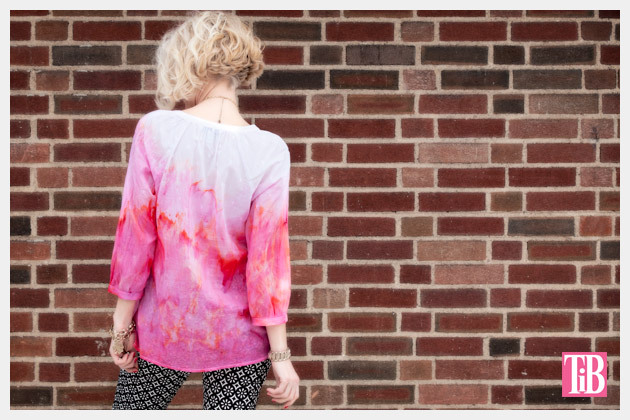 What happens when you mix great spring fashion from Old Navy and the Tulip One Step Tie Dye Kit? 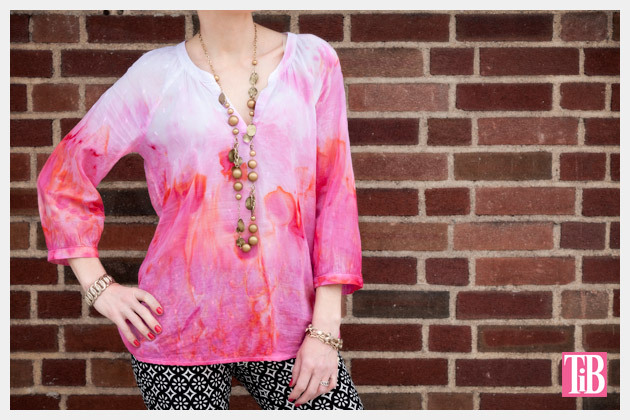 Why, this fabulous Ice dyed Tunic, of course! 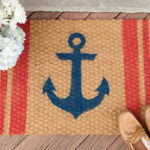 When i Love To Create asked me to make a DIY with some of the fabulous spring fashions from Old Navy I was so excited. 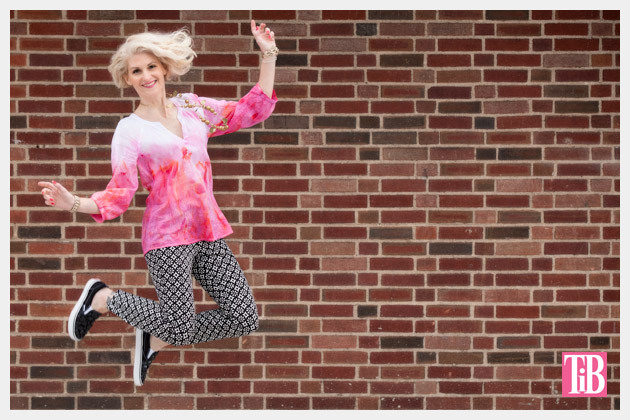 They have a lot of really cute cotton tunics, pants and dresses for spring that really lend themselves to fun and simple embellishments. 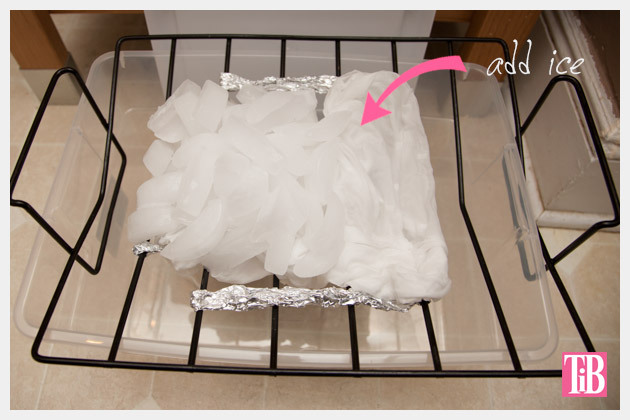 This process of ice dying is so simple and you really get great results. 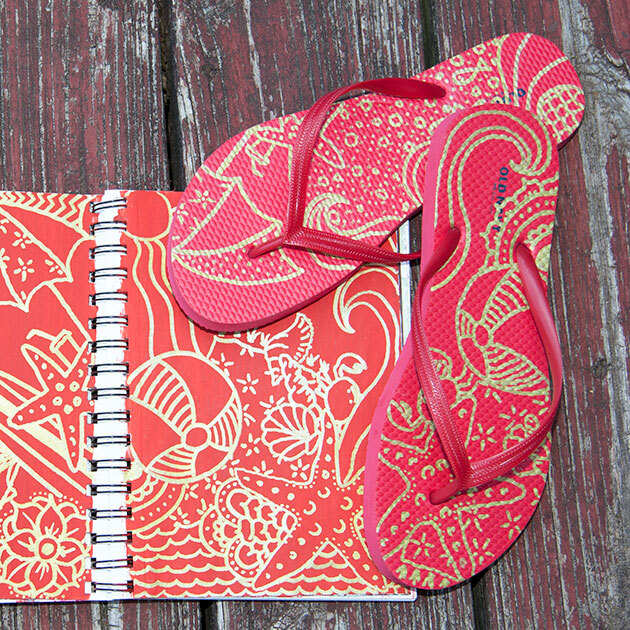 It’s a really cool way (pun intended) to update and personalize your clothing for spring. Ok, so by the mounds of snow we still have hanging around it’s not really spring weather but I can dream right? 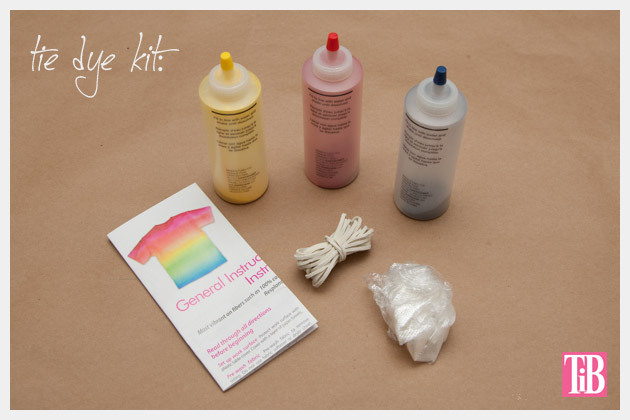 Tulip gives you everything you need to create great color with their tie dye kit and there’s more than enough dye in one bottle to do 1 top with dye to spare. 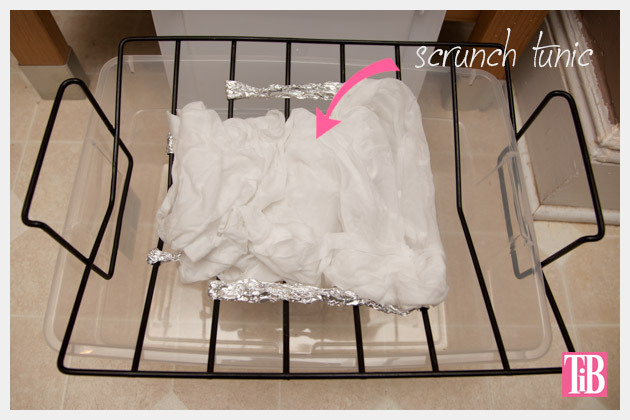 You’ll need some sort of wire grill or something to hold your shirt up an inch or two above the bottom of the plastic bin, this will keep your shirt from sitting in the water and dye, which will ruin your dye job. 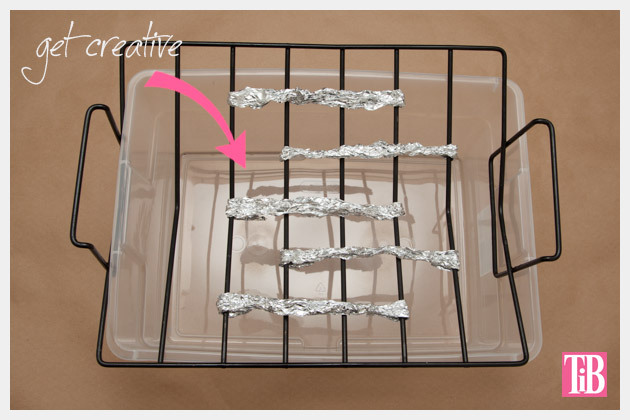 Get creative and improvise, I used foil across the grill from a roasting pan. Bunch up your shirt and lay it on top of your your grill. You can get your shirt wet or keep it dry. 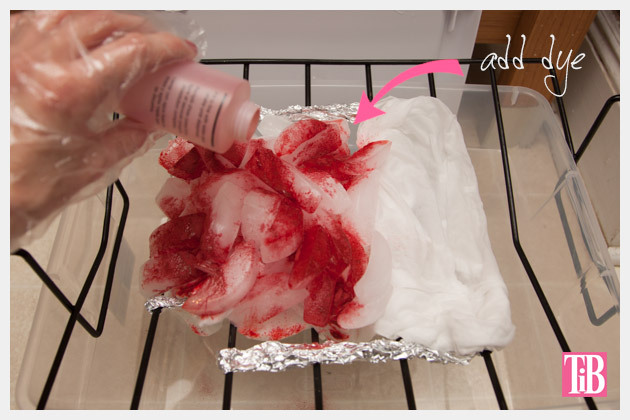 If you choose to get it wet the dye will bleed more and you will have more overall coverage of the dye. If your shirt is dry they dye will sit in specific areas more. Pile ice cubes on top of your shirt. 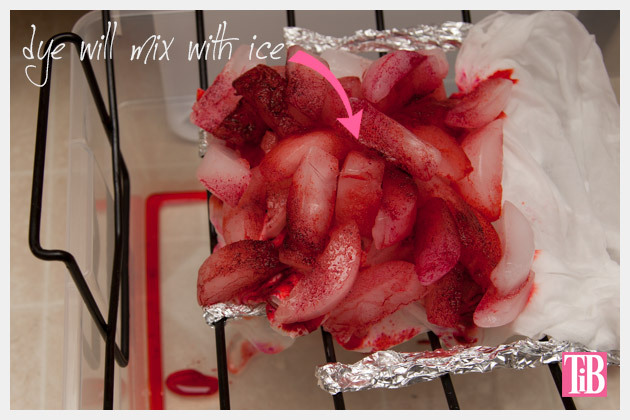 Wearing the gloves from your tie dye kit, sprinkle the powder dye on top of the ice cubes. I used the red dye. 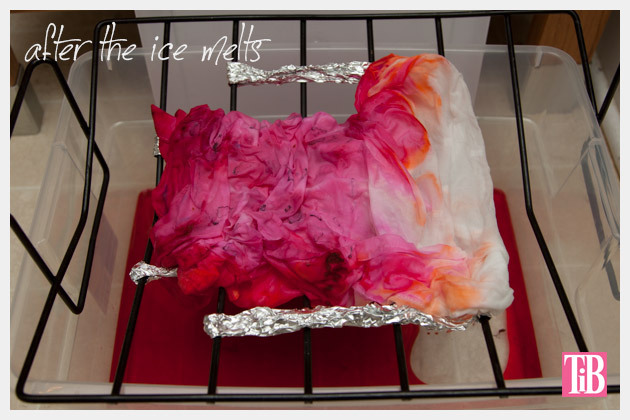 As the ice melts it will mix with the dye and soak into your shirt, creating a pattern. The first time I got my shirt wet before adding the ice and dye. The color I got was very light and it really blended together. So, I waited until the shirt was dry and bunched it up dry and put ice only on the bottom half of the shirt and added more red dye in 3 lines across the ice (the lines were horizontal to the bottom hem of the shirt). I let the ice melt and let the dye sit over night. I was much happier with my results. The designs you get with this technique are mostly very random. As you play with it you can learn how to manipulate your shirt and where you place the dye to have more control over your design. For stronger color and sharper edges I recommend starting with your shirt dry. You will need to wait for your ice to melt completely before you see your design. I also let mine sit for another couple of hours to make sure that the dye really set into my shirt. 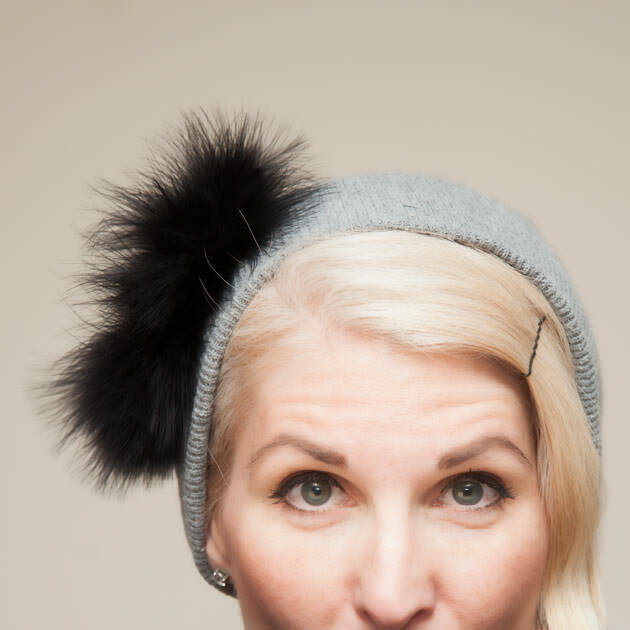 If you rinse it out too early your dye color will not be very strong. Once your dye is finished, rinse out your shirt until the water runs clear. Let your shirt air dry or you can wash it in the washing machine, I would recommend avoiding the dryer as it may fade your color. 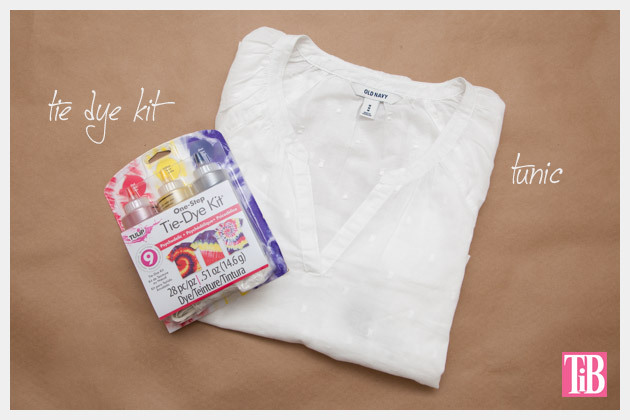 The Tulip Tie Dye Kit and cute spring fashions from Old Navy go hand in hand. 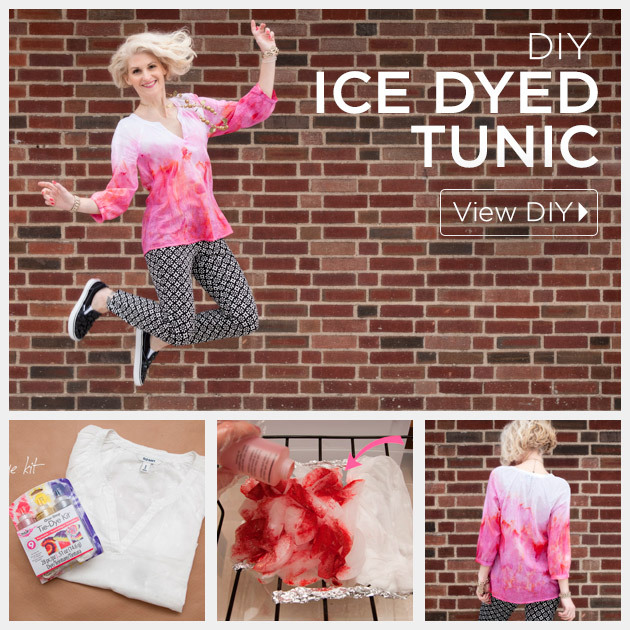 Create your own style using this fun and simple dyeing technique. I loved how using only red dye I was able to get such pretty hot pinks and oranges with this technique. The pants in this post are also from Old Navy, I just couldn’t help but pick them up to go with my top. I love the cool geometric print! And it goes really well with the ice dyed top! 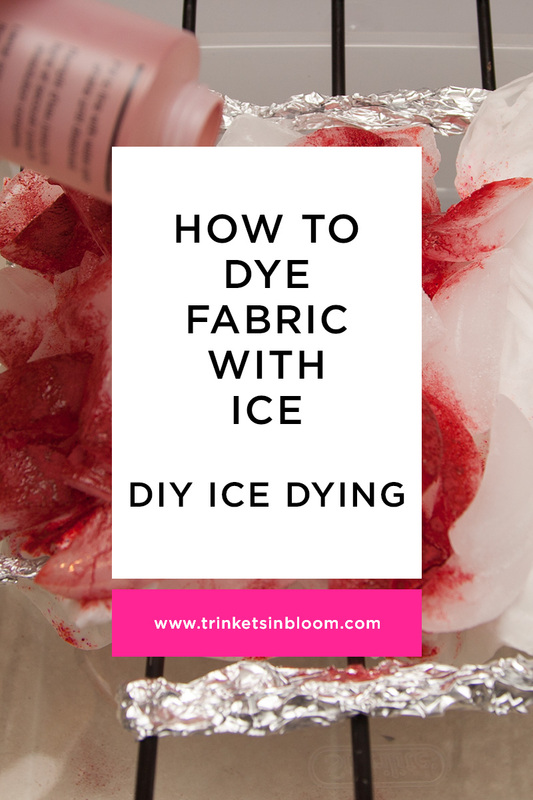 Have you tried ice dyeing yet? Leave me a comment and let me know! This is a sponsored post. I have been compensated for this post, however all opinions, DIY tutorial, design are all mine. Am trying this great idea now. Was curious though if I can use a blow dryer to speed the process up? The anticipation is killing, lol. I thought about using a blowdryer too! LOL I suppose you could but you’d still want to let the dye sit on the fabric for a few hours to make sure you get good color.